If you are struggling with how you want to decorate your home this Christmas, why not take my advice. Tone it down, and try a more Scandinavian inspired Christmas. There is something so serene and special about the way that Scandinavian Christmas decor comes together. Its almost magical. So, lets start today by seeing how I have decorated my mantel with handmade Scandinavian Christmas in mind. I am excited to be here today to join up with some amazing bloggers to show you our mantels for Christmas! Thank you to my friend Amy and My Life From Home for putting it on! I love creating a pretty mantel for each season and I do think that Christmas by far is my most favorite one to do. Each year I try to reinvent myself, and create something new and inspiring for you! I don’t know about you, but I love to see images of pretty rooms and spaces on Pinterest. They are so inspiring to me. I have toyed around with really embracing the Scandinavian style in my Christmas decor for a few years now, but was really nervous about being able to pull it off. I mean, probably out of all the decor styles I love, Scandinavian is right up there at the top. I love the simplicity of Scandi decor…the use of woods, furs, white, white, and more white, with some black touches along with the use of fruits in your decor as well as greenery. You really cannot go wrong! But, you can overdo it. The key to Scandinavian Christmas decor is to keep it simple. Do not overdo it, which is really really easy to do! For my mantel this Christmas, I wanted to put my own take on the Scandinavian Christmas style and out my own personal touches so that it made sense in my home. Some Scandi inspired elements I wanted to use was the use of whites, fruits, and candles! I also wanted to use some natural evergreen as well, but I really tried to focus on keeping myself in check and not going overboard. I wanted each thing that I put on my mantel to be purposeful. My goal was not to overwhelm the space with Christmas, but to let it gradually build and be a peaceful space for my family. 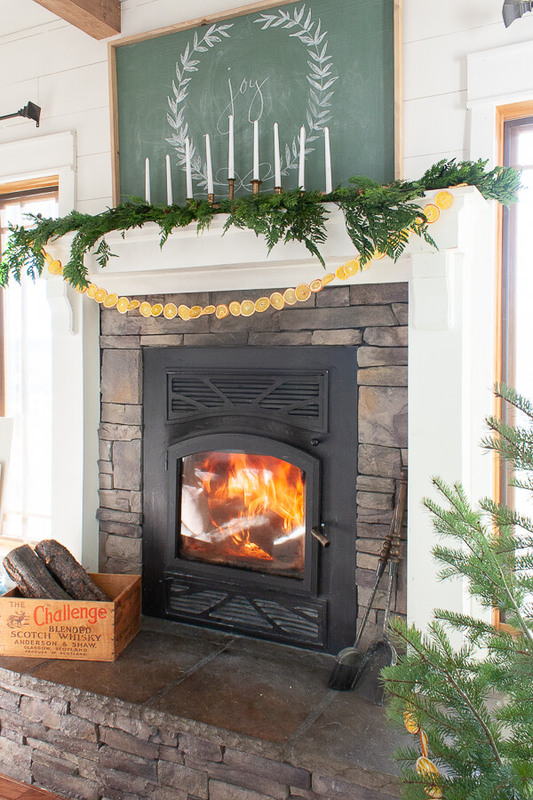 To start decorating my Scandinavian Christmas mantel, I cleared off my mantel, making sure that there was nothing that would interfere in my goal. 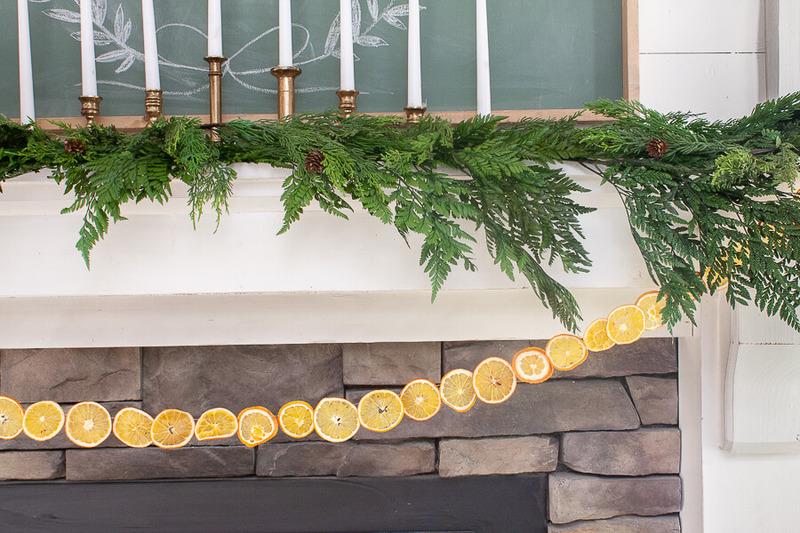 The first thing I did was create my dried orange garland, and I will be posting about how I did this tomorrow! So stay tuned! My friend actually inspired me to use the oranges and together we made a ton of dried orange garlands! I plan to use them on my Scandinavian Christmas tree as well! So stay tuned for that as well! But, lets get back to my Scandinavian Christmas mantel. 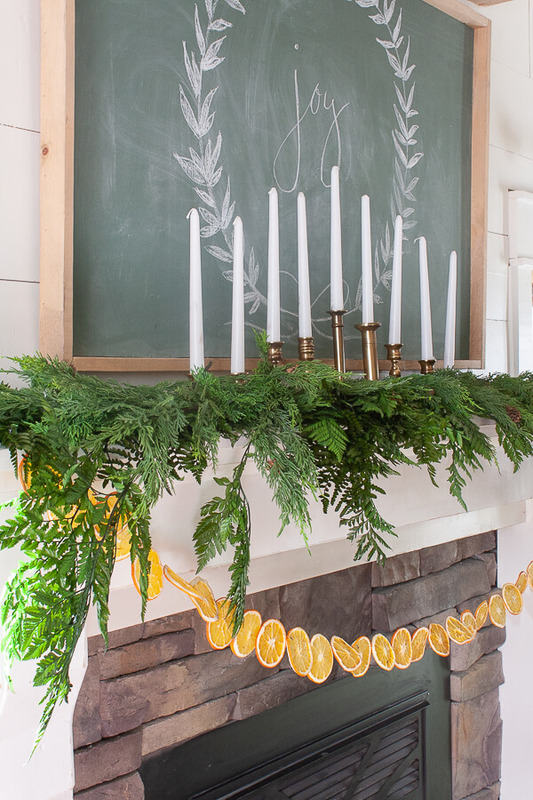 Once my mantel was cleared off, I started by adding my handmade vintage green chalkboard. This was a really fun project and its been so fun to use in my home. You can make your own here! I wanted to create a simple piece of artwork on it that would be simple yet beautiful and combine well with the rest of my mantel decor. I think my JOY works well! 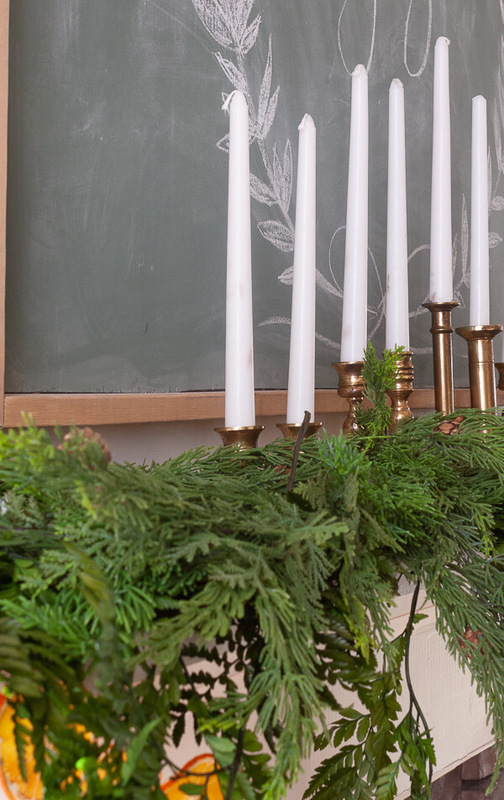 The next thing I added to my Scandinavian Christmas mantel was candles….lots and lots of candlesticks! A few years ago, my moms friend was going to throw out a whole box of Baldwin brass candlesticks. I immediately told her that I wanted them all! And they have been sitting in my art closet since then. I did take a couple of them and gave them a farmhouse style patina to them. When I was thinking about doing a Scandinavian style Christmas I knew I was going to be able to use these candlesticks, since candles are a big part of the Swedish, Nordic, and Scandinavian Christmas decor. I wanted to taper them from tallest to shortest. Aren’t they the prettiest? I cannot believe I have waited this long to use them. I think they need just the perfect place and time to use them, and Christmas is the perfect time! After I put my candlesticks up, I used some preserved greenery around them all. I wanted the greenery to practically hang off the mantel. I did not want it to waterfall, which I usually do. I wanted to keep it all on top of the mantel, nestled in between each candlestick. 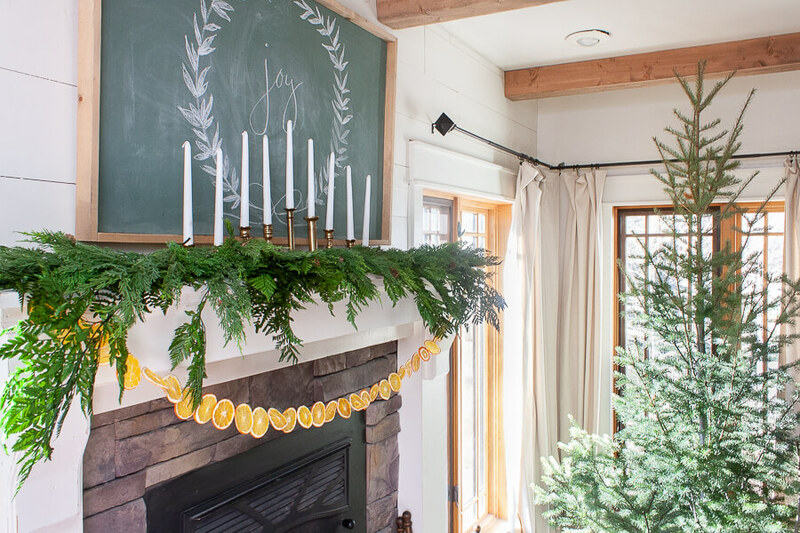 The last thing I added to my Scandinavian Christmas mantel was my dried orange garland. I dropped this down a bit so that there was a separation between the garland and the rest of the mantel decor. 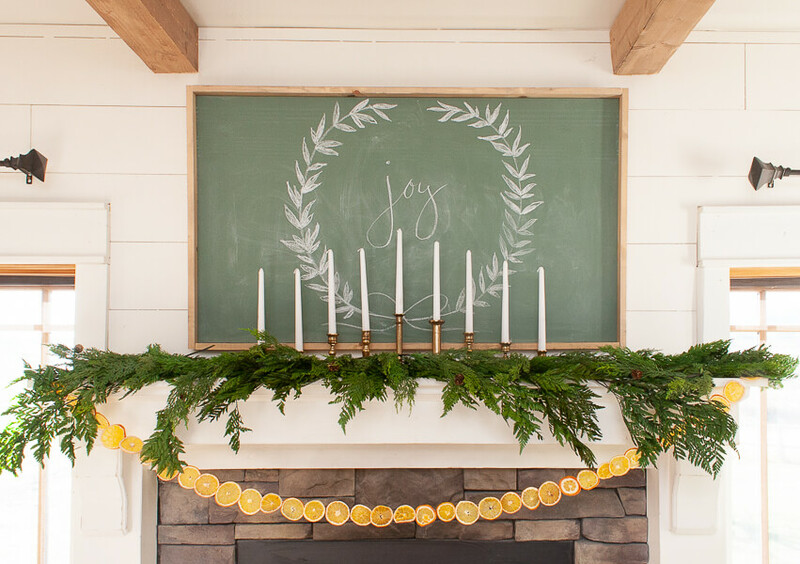 It was important to me that this orange garland was the highlight of my Christmas mantel….and I think it is. The simple pop of color is exactly what I wanted. You can see something peeking in from the ceiling in the picture below…..we installed faux beams in my living room last weekend and I am so so so so so very in love with them! You can see how I install faux beams here! I finished off my fireplace with a crate with some firewood…since we keep a fire roaring in our fireplace every day during the winter, this crate seemed like the perfect place to keep a few extra pieces of firewood. 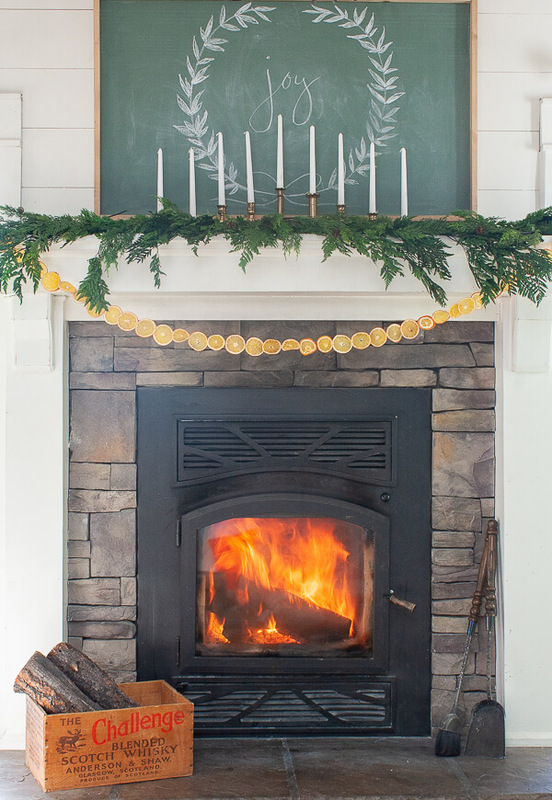 And with that…my Scandinavian Christmas mantel is done! Now, I know that the chalkboard may not be totally Scandi inspired, but, I wanted to add my own take to it, and I think it is a fun addition. The whole Christmas mantel brings me so much JOY. I cannot wait to show you the rest of my home for Christmas this year! If you like this Scandinavian Christmas look, I’ve looked around to find similar items that you could add to your home! Check them out below! Have a great day and I hope you enjoy this Christmas season for what it is! I am going to try to just enjoy every day, make time for simple Christmas activities with the family and listen to as much Christmas music as possible! If you like this post, I have so many other great Christmas mantels to check out too! And make sure you check out these other great Christmas mantels! I have so many Christmas posts, I hope you’ll spend some time checking them all out! « The Best Tortilla Soup Recipe Ever for the Crock Pot, Stove Top, or InstaPot! 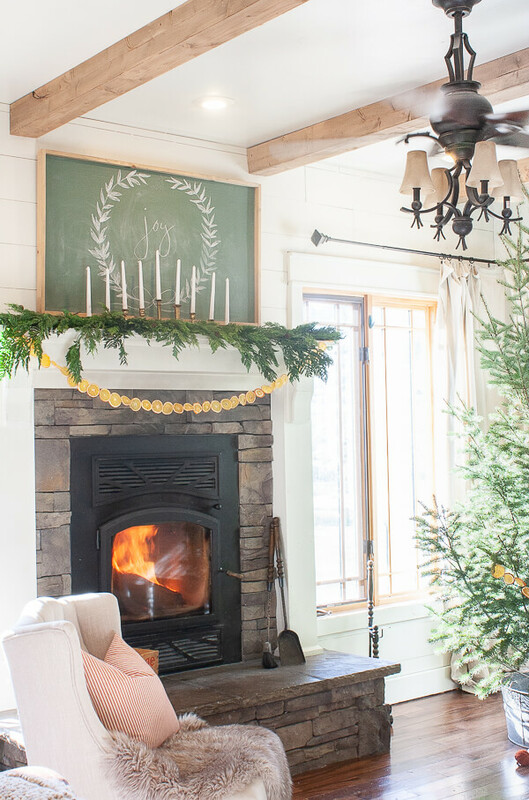 Goodness Sara – this mantel is Christmas perfection! We too appreciate the Scandi style but have never tried it in our homes. You have created something truly beautiful here. The dried oranges are a wonderful touch, and we love your chalkboard! Heading over to read about the faux beams too~! I love your mantel Sarah! 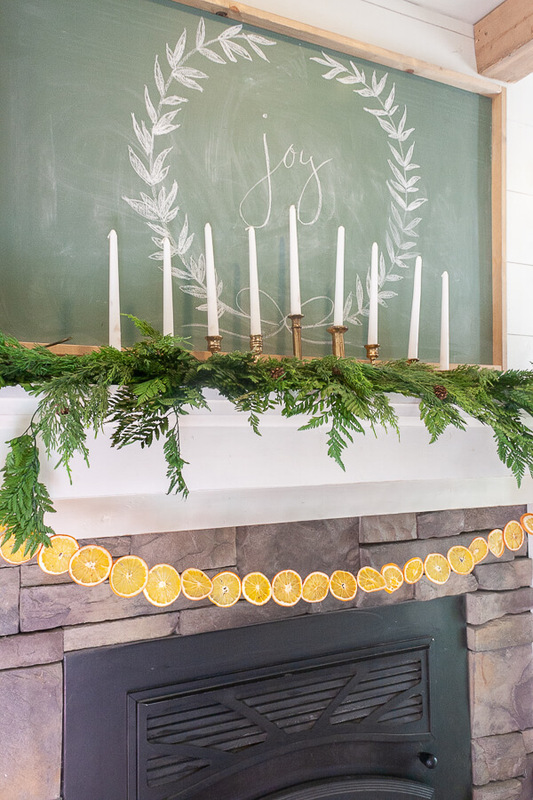 And I am so excited for the dried orange garland tutorial. It is so pretty!!! This is just beautiful! I love your simplistic Scandi take—I think you did a wonderful job! 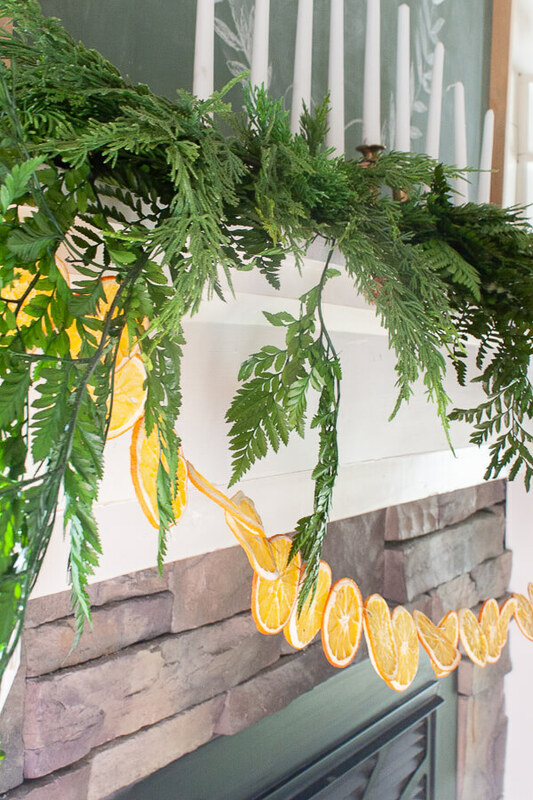 And that orange slice garland is a perfect finishing touch!